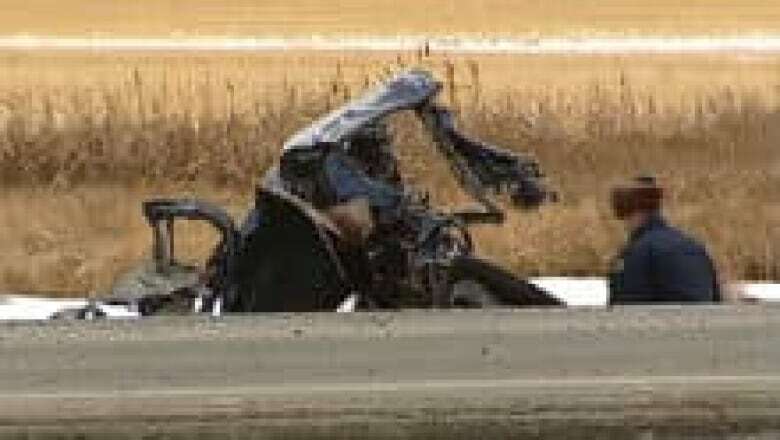 A 28-year-old Beaumont, Alta., man is facing three counts of drunk driving causing death after a highway crash southeast of Edmonton that killed three young men. The 28-year-old was driving a pickup just before 3 a.m. Nov. 26, 2011 south of Beaumont on Highway 625 when he crashed into a car carrying three men travelling in the same direction. Two 18-year-olds and a 22-year-old, were killed. The pickup driver was flown to hospital in critical condition. The man is now charged with three counts each of impaired driving causing death, driving with a blood-alcohol content over .08 causing death and manslaughter. "Manslaughter is not a typical charge that you will see laid with fatal collisions," said Const. Jodi Heidinger. "The forensic analysis in this particular case revealed that the amount of speed as well as the impairment were objectively dangerous enough to cause the death of another person," she said. "The amount of alcohol in (the accused's) system was well beyond the legal limit," said Heidinger. Police do not believe the accused and the victims knew other, she said. He was taken into custody on Friday after being released from the hospital and will appear before a judge in Leduc provincial court Thursday. While the man is out of hospital, he will still require onging medical treatment, said Heidinger.